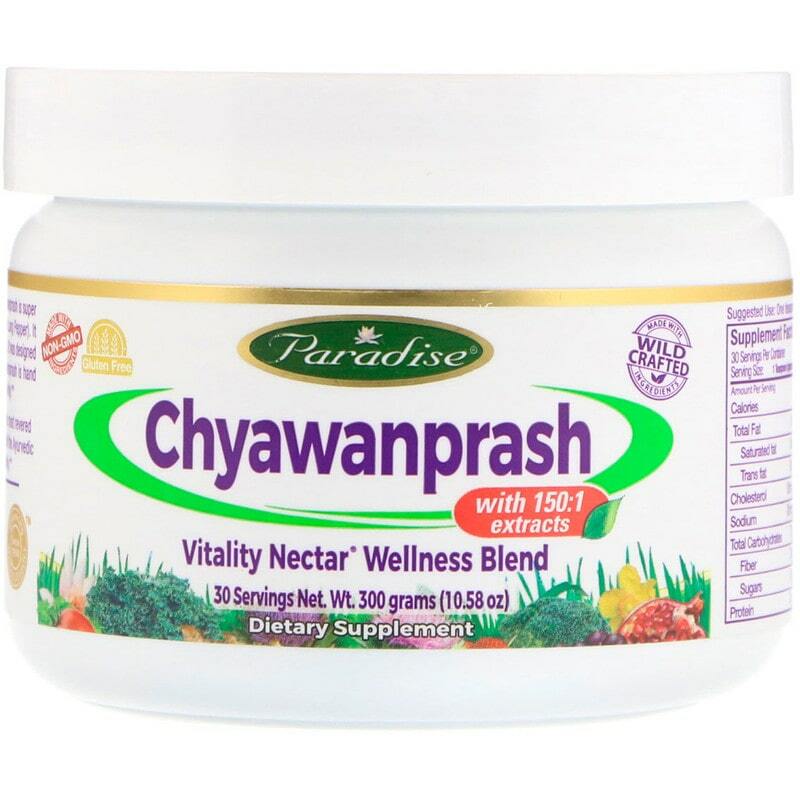 Chyawanprash is the most popular Ayurvedic rejuvenating tonic since the times of the Vedas. It is a nutritious herbal supplement that supports your immune system and improves overall health. 5. Which Chyawanprash brand is the best? 6. How to use Chyawanprash? 8. 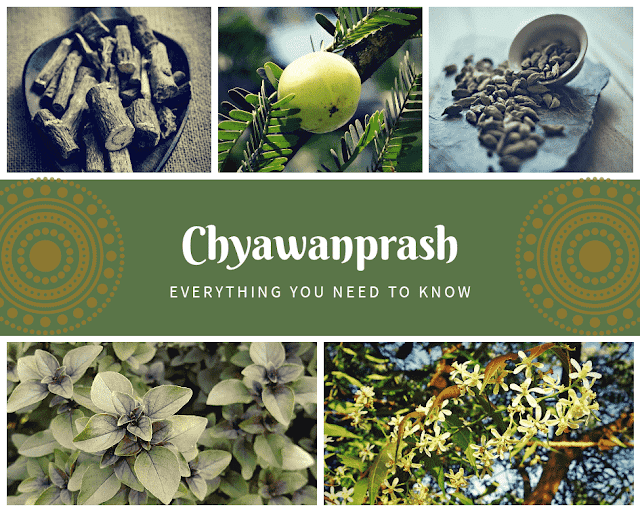 How Chyawanprash is made? Chyawanprash has a consistency of jam and contains of more than 40 natural Ayurvedic ingredients that have proven medicinal properties. 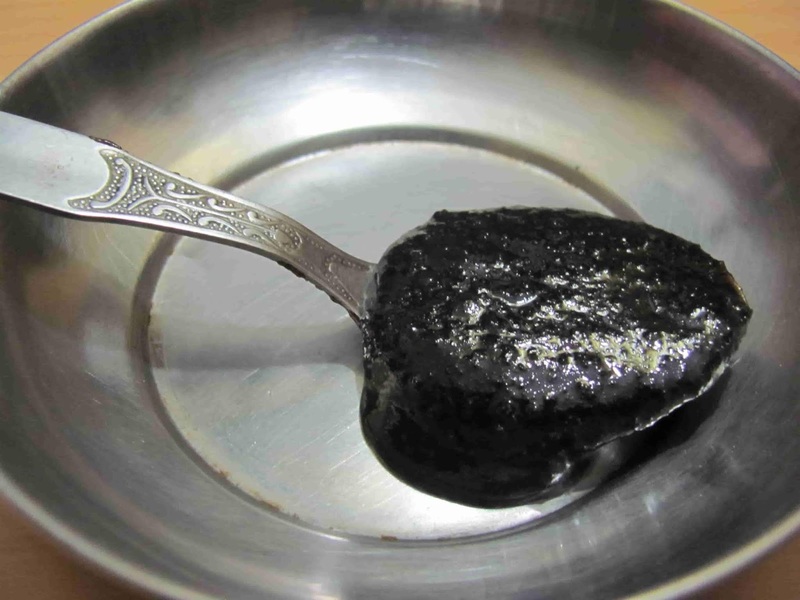 The first historically documented formula for Chyawanprash appears in the Charaka Samhita, the ancient Ayurvedic text. This nutritive formula was named after sage Chyawana. He is mentioned in the Rigveda, where he is described as an aged and feeble person whose youth and strength was restored by the ancient Ayurvedic doctors after they prepared the first Chyawanprash for him. It is also known as "The nectar of eternal youth" and "The elixir of life" due to its many nutritional properties. As a proven and rich source of vitamin C, adaptogens and antioxidants, Chyawanprash offers a wide range of health benefits. - Chyawanprash rejuvenates all of the seven tissues (dhatus) in the body and builds Ojas – the essence of vitality and immunity. - It kindles Agni without aggravating Pitta dosha. It pacifies Vata, Pitta, and Kapha dosha. - It contains five of the six tastes—lacking only the salty taste. Ayurveda recommends including each of the tastes in every meal to maintain balanced nutrition and good health. - It is helpful in maintaining overall health. - Regular intake of Chyawanprash enhances the functioning of the gastrointestinal tract and strengthens digestion, absorption and assimilation of food. - Helps to break down toxins and prepare them for elimination by purifying the liver, intestines and blood. - Helps in weight loss by normalizing the body’s metabolism. - Promotes easy bowel movement. - Normalizes the endocrine system. - Normalizes menstruation and reduces pms. - It promotes healthy growth of fetus in the womb. - Increases strength and stamina. - Prevents seasonal infections, common cold and cough. - Chyawanprash is used to treat pulmonary tuberculosis. - Helpful in diseases related to the urinary tract. - Increases hemoglobin, and regulates cholesterol. - It is a proven energy booster. - Improves skin complexion. To achieve lustrous and glowing skin, take Chyawanprash regularly. - It improves the oxygen supply in the tissues and slows down aging of cells. - Reduces the chances of premature wrinkles and graying of hair. - Strengthens hair and nails. - Helpful in increasing longevity of life. - Provides strength to the sense organs. - Improves memory, learning ability and intellect. - Decrease chronic fatigue syndrome. - It activates and strengthens the immune system. - Chyawanprash is used for treating gout. - Useful in heart related problems. - The herbs it contains have potent anti-stress, anti-anxiety and anti-depressant actions also. There are several small scale studies that show the efficacy of Chyavanprash. The main ingredient of Chyawanprash is amla, an Indian gooseberry that has the strongest antioxidant activity in the world. It contains 75 times the antioxidant power of goji berries, 50 times the antioxidant power of raw blueberries, 44 times the antioxidant power of spirulina, 2.5 times the antioxidant power of acai berries, and 2 times the power of turmeric. Amla fruit is rich in Vitamin C, containing about 800 to 920 mg of Vitamin C per 100 g. that means it contains 20 times more vitamin C than oranges. 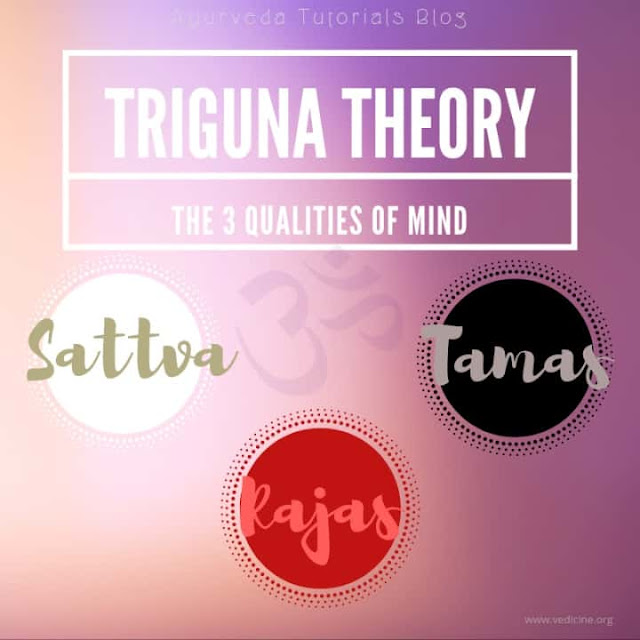 It pacifies all three doshas: Vata, Pitta and Kapha. All parts of amla are used in various Ayurvedic preparations, including the fruit, seed, leaves, root, bark and flowers. 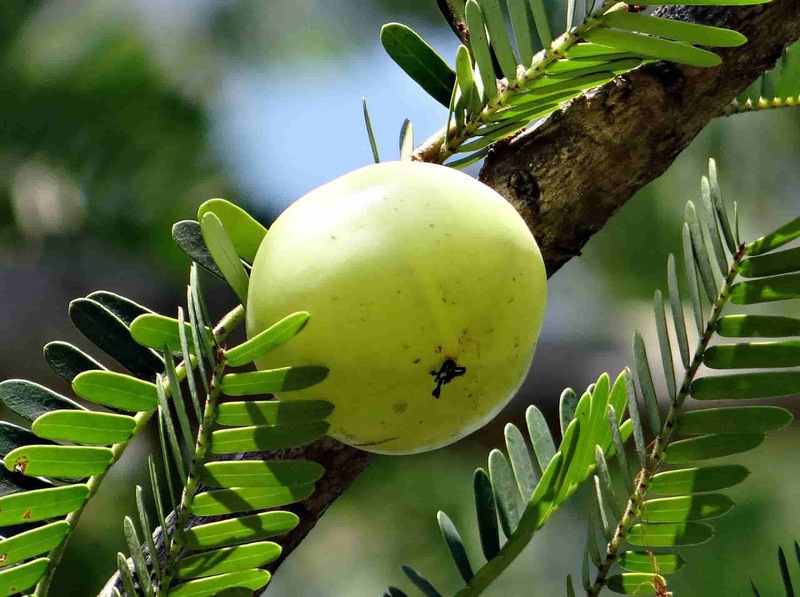 Amla fruit is sour and astringent in taste, with sweet, bitter and pungent secondary tastes. Its qualities (gunas) are light and dry, the postdigestive effect (vipaka) is sweet and its energy (virya) is cooling. According to the traditional instructions for making chyawanprash, the amount of amla is over 100 times the amount of each of the other herbs. When amla is cooked with certain other spices and herbs, the potency of the mixture increases. None of the Chyawanprash available in the market is authentic. There are more than 40 ingredients in the original recipe and some medicinal plants are very rare or not available at all these days. The exact ingredients in every Chyawanprash recipe can vary from one brand to another. The composition may vary between 25 and 80 herbs, depending on the manufacturer. The original formula is vegetarian but not vegan. It contains honey and ghee. Honey is much more than a sweetener. It has high nutritional and medicinal value and promotes healing process. Raw, unheated honey combines with ghee and jaggery to carry the medicinal qualities of the herbs deep into the tissues. Jaggery and honey added to the chyawanprash act as a natural preservatives. Be careful and always read the labels before buying Chyawanprash. Since Amla fruit is not available throughout the year, some manufacturers use various ridiculous replacements like sweet potatoes or pumpkin. Instead jaggery or honey, cheap white sugar is being used. Sometimes gold and silver are added into it for making it more effective and more expensive. Improperly prepared metals, or taken in excess amount, may cause various side effects. In ancient Ayurvedic texts there is no mention of adding gold or silver in Chyawanprash. Some of the well-known natural consumer products manufacturers use harmful preservatives to make Chyawanprash. 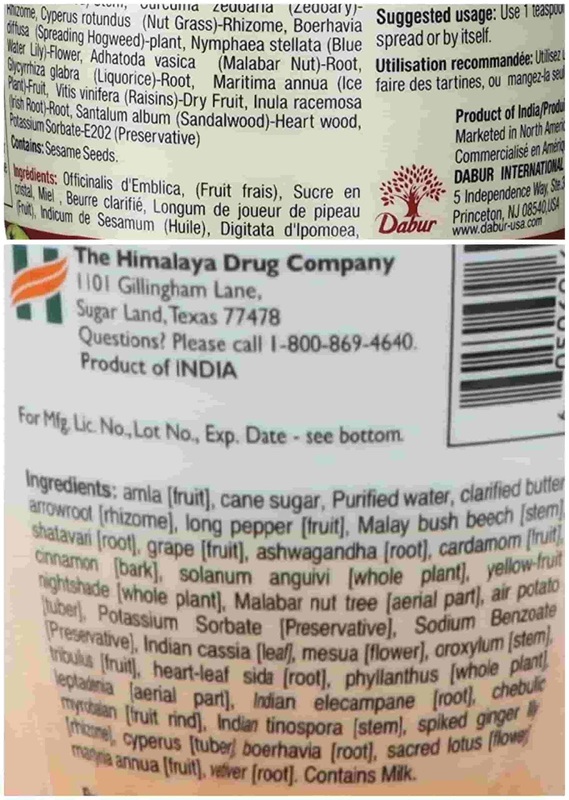 In the picture above, you can see that Dabur uses potassium sorbate, and The Himalaya Drug Company uses both potassium sorbate and sodium benzoate. Which Chyawanprash brand is the best? The best Chyawanprashes are those made without preservatives, pH stabilizers, metals and artificial flavors. Paradise Chyawanprash is hand made with the freshest Amla and prepared in the traditional way for maximum therapeutic activity. It is formulated with an extra emphasis on using pure ethically wild crafted and clean ingredients. It is made without fillers, binders or GMO ingredients and contains no wheat, corn, soy, yeast, preservatives, or artificial ingredients. It is suitable for vegetarians, non-gmo and naturally gluten free. If you want the best, Paradise Chyawanprash is an excellent choice. You can purchase it here. Chyawanprash is suitable for all ages, from young children to the elderly. When you open the jar from the first time, mix the jam thoroughly with a spoon. Do not use if safety seal is broken. Recommended dosage is 1 teaspoonful twice daily preferably followed by warm water or warm cow's milk. Do not use store bought or frozen milk. Take it in the morning on empty stomach and before bedtime for at least 3 months. A child who weighs 15 kg could take 1/5 teaspoon daily. Older children can take ½ teaspoon daily. Some people use Chyawanprash as a jam spread over bread or toast. That is not the right method. Chyawanprash should not be mixed with any other food, but it can be taken before or after food. Since it has a long shelf life, refrigerating is not necessary. Keep the jar in a cupboard. To get the full effect of Chyawanprash you may have to purify the body first with Panchakarma, in order to assimilate the rejuvenating properties. Panchakarma (five Ayurvedic purification therapies) is the best way to detoxify your body. It is done in professional Ayurvedic clinics and requires supervision by educated Ayurvedic physicians. As Chyavanprash is slightly heating, it is the best to reduce or completely avoid this jam during the summer. Avoid it if you have diabetes, gastritis, phenylketonuria, vitamin C metabolic disorder or of you are allergic to any ingredient in Chyawanprash. Eating too much Chyawanprash may cause diarrhea, upset stomach and high blood sugar. Making Chyawanprash requires a lot of time, patience and expertise. In this video Dr. Pranit Ambulkar (MD, Ph.D.) demonstrates practical steps in preparation of great medicine of Ayurveda- the Chyavanprash, its in-process tests and tips for easy manufacturing.